Innovative audio scheduling, paging, emergency notification, and school bell system. 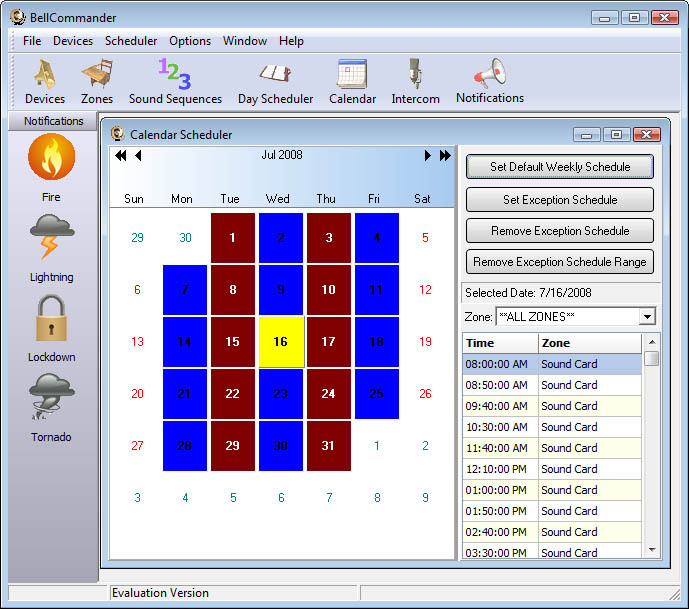 BellCommander's scheduler is ideal for factory and school bells with support for unlimited day schedules, multiple zones, and over 200 events per day. Innovative audio scheduling, paging, emergency notification, and school bell system that is used by hundreds of schools, factories, and businesses. BellCommander's audio scheduler is ideal for factory and school bells with support for unlimited day schedules, multiple zones, and over 200 events per day. Audio can be played through the PC's sound card, to networked PC's with the BellCommander client installed, and to network audio players. Bells, sirens, lights, and intercoms with contact closures can also be controlled using external relay controllers. The external relay controller acts as a flexible and easy-to-use alternative to traditional electronic and mechanical timers. In addition, BellCommander can send bells over traditional PBX phone systems and modern IP phone systems that support SIP. BellCommander can also be used as a paging and emergency notification system. Using a standard IP network, pages can be sent to networked PCs and to network audio players. Pages can be targeted to individual PCs or network audio players, to groups of clients, or to the entire system. Pages may be pre-recorded or broadcasted live from a PC microphone or SIP phone. G&G MESITIKO is a complete solution for every real estate office. It allows the entry of every property with photos and every prospective buyer that enters the office. Then, the InteliSales (tm) system allows the maximization of the profits. eClinic is a practice management software for doctors. The program is very easy to use with shortcuts, dropdown menus, macros etc so that symptoms, prescription and diagnosis can be easily entered. Instant Customer Tracker is your total solution for Customer Tracking and e-mailing your Customer base. With Instant Customer Tracker, you can track your Revenue, Customers, Prospects, Group List Members. Perfect for opt-in e-mailing & tracking. MIE CRM Software delivers Customer Relationship Management across the sales, service, and marketing functions. This easy-to-use, full featured solution primarily aims to strengthen the sales sector and the customer support department of a business. MIE Dashboard is a revolutionary business management and collaboration tool that centralizes the storage of business specific files into an easy to use virtual drive. The automated solution is designed to meet the needs of all organizations. AreaBluetooth is an innovative software application of Bluetooth Wireless Technology, it can send multimedia messages to most mobile phones in the neighbourhood without any cost. SaasLight is a free Web based CRM Software and customer management software. Manage leads, accounts, opportunities, contacts, surveys, forums, incidents, cases and solutions. Show Classic Menus and Toolbars on the Ribbon of Microsoft InfoPath 2010. All new features of InfoPath 2010 have been added into the software. You don't need any training or tutorials if you use InfoPath 2007/2003/XP/2000 before. This site does not contain serial number, crack, keygen BellCommander serial number : serial number is the simplest type of crack. A serial number(cdkey,product key,etc) is register the program as you may already know. a crack or keygen may contain harmful software. If you cannot find the exact version you want, just give it a try. for more information read .nfo/.txt/.diz file include in zipped file.